How to get image from url and insert into database and store image in your local root folder through PHP and mysql? Description:- Hi ! In this tutorial I’m going to provide you code to get the image from url and then to store in the database as well in your local root directory or in a folder. You can also include this type of image search thing in your website so that user will get limitless option to upload a picture. I use rand() function to rename the image name and it will be helpful for you when you make a large website. 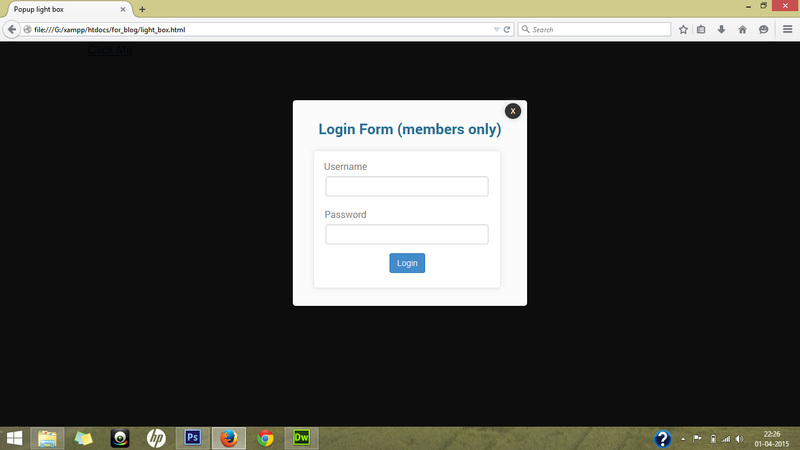 How to make your own custom Light-box popup Login form through jQuery ? Description:- Through this example you can easily make your own custom popup Login form through jQuery. I’m using this popup Login box for my website. So, for this example you need to save three files in the same folder in which you are going to save your HTML file. In this example the name of my HTML document is light_box.html. How to upload and resize an image through GD PHP ? Description:- Through this simple example you can easily upload your image file with the extensions of gif, png, jpg and jpeg and after uploading it will automatically resized. *Note :- Remember one important thing don’t forget to make a new folder and rename it as “uploads”. In this folder your all uploaded files as well as your resized files will going to save. Follow the video for more details…. How to check and uncheck all the check boxes in just one click through jQuery ? Description:- Through this example you can easily check all the check boxes of the list. So that you can delete them or you can perform whatever you want to do. This example includes jQuery file so download it from http://jquery.com/download/ or click on the link http://code.jquery.com/jquery-1.11.2.min.js and save it in the same folder in which you are going to save this example. *Note:- After writing all the aforesaid codes make one more page and name it as profile.html (which is mentioned in the form action). And don’t forget to include 3 main Bootstrap files in this example because this example is totally Bootstrap.